Beautifully engraved certificate from the Crowell - Collier Publishing Company issued in 1965. 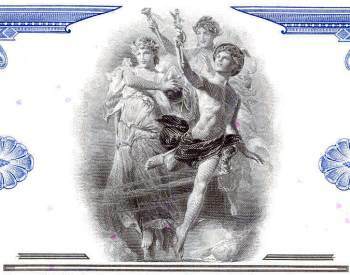 This historic document was printed by the American Banknote Company and has an ornate border around it with a vignette of gods and goddesses. This item has the printed signatures of the Company’s President and Secretary and is over 38 years old. A devout Irish Catholic, P.F. Collier went to a seminary to become a priest but instead ended up working as a salesman for P.J. Kennedy, publisher of Catholic books. He suggested sales could be increased by offering books on a subscription plan. Kennedy disagreed so Collier started his own subscription service. 1888, founded family magazine "Once a Week". 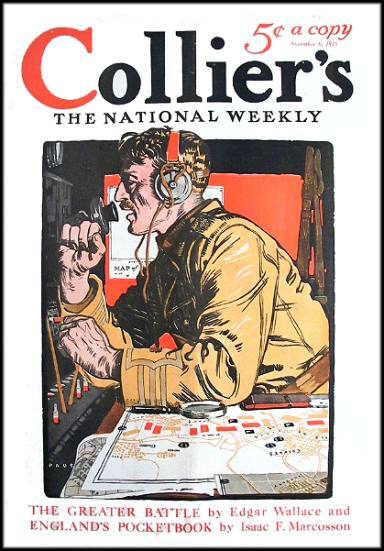 Later, he changed the name to "Collier's, the National Weekly." 1898, his only son, Robert J. Collier became a partner. Together, they made Collier the largest subscription house in America. In the decade 1900-1910 they sold over 30 million books. Collier was acclaimed "Father of the Modern Subscription Book Business." 1909, introduced "The Harvard Classics". The president of Harvard, Charles William Eliot, said in a speech a man could acquire a complete liberal education from a five foot book shelf. R.J. Collier challenged him to select the books for that shelf and the Harvard Classics was the result. "Dr. Eliot's Five Foot Shelf" and "Fifteen minutes a day" became slogans. In 1921 Colliers purchased Harper's subscription buisness which included a subscription set of Mark Twain. Peter Fenelon Collier died in 1909. 1919 the company was sold to Crowell Publishing Co., which for years operated Collier as a separate division. 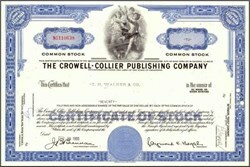 Crowell was renamed CROWELL-COLLIER PUBLISHING CO. with Collier as a subsidiary. Circulation of the magazine declined steadily after 1950 as radio, television and the rise of a new generation of national news weekly’s – including Time, Life and Newsweek – adapted to the changing national tastes. Compounding Collier's problems was the television industry which provided less expensive advertising then the magazine could afford. While the Saturday Evening Post exists today in monthly format, Collier's Magazine ceased publication on December 16, 1956. After the magazine shutdown, the company continued to publish Collier's Encyclopedia and Collier’s Junior Classics.